India’s Sahitya Akademi promotes Indian literature worldwide, in part by presenting awards to authors and translating winners’ works. Though an autonomous institution, the Akademi functions under the Indian Government’s Ministry of Culture. On September 4, 2015, writer Uday Prakash returned his Sahitya Akademi award in protest of the murder of M.M. Kalburgi and decreasing literary freedom. In the next month, Prakash was joined in his protest by 55 more winners and members of the academy, including Shashi Deshpande, Nayantara Sahgal, Krishna Sobti, and Ashok Vajpeyi. 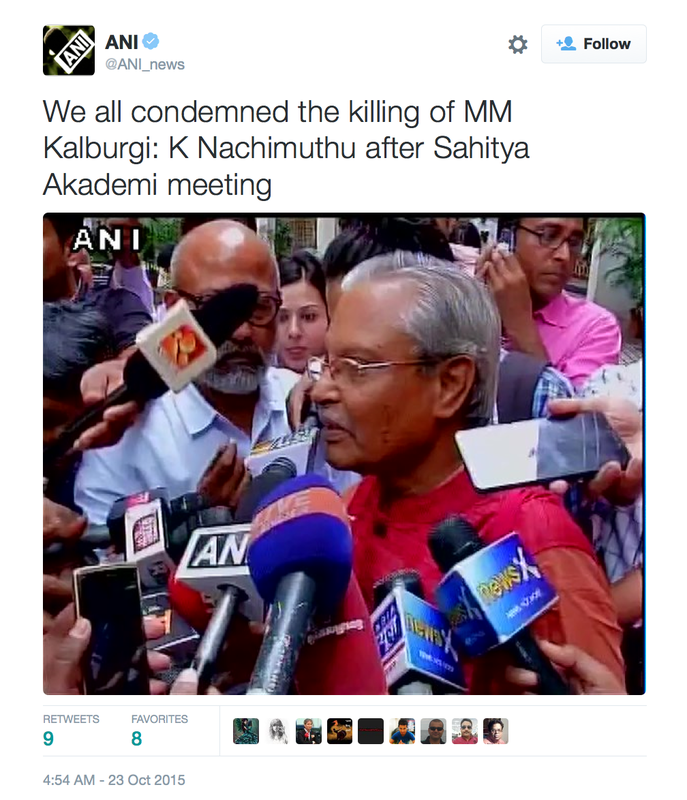 On October 23, 2015, Sahitya Akademi responded with a resolution condemning murders of Indian writers. The text of that resolution is below. The Executive Board of the Sahitya Akademi, at its special meeting on 23rd October 2015, is deeply pained and strongly condemns the murder of Prof M.M. Kalburgi and the other intellectuals and thinkers. 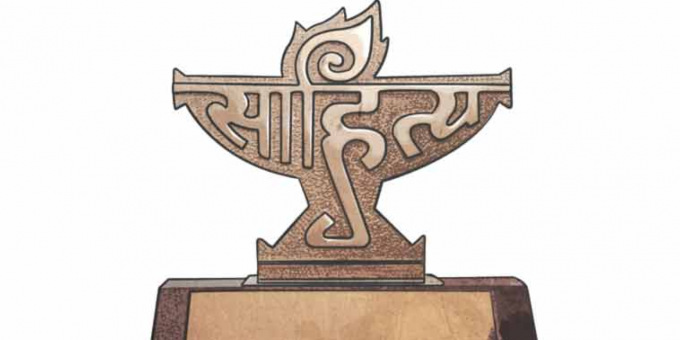 As the only autonomous institution of Indian Literature in all its diversities, the Akademi firmly supports the writers’ right to freedom of expression in all the languages of India and condemns any atrocity against any writer anywhere in the country in the strongest of words and asks Governments at the center and in the States to take immediate action to bring the culprits to book and to ensure the security of writers now and in the future. The spirit of plurality that Indian culture embodies has been a much sought after ideal for the rest of the world. This is what should be protected. Sahitya Akademi demands that Center and States maintain the ambience of peaceful coexistence in the societies and it urges various communities of our society to put aside the differences on the grounds of caste, religion, region and ideologies. Sahitya Akademi is an organization of writers for writers, an institution guided solely by writers. All its decisions including those on the awards are made only by the writers. In this context, we request the authors who returned awards or have dissociated themselves with the Akademi to reconsider their decisions. Akademi’s Executive Board believes that the cooperation of writers should strengthen the autonomy of the Akademi which has been held high in the 61 years of its history. This meeting of Executive Board notes that upon the assassination of Prof. Kalburgi, the President of the Akademi had telephonically requested the Vice-President to contact Prof. Kalburgi’s family and to convey the sense of pain and outrage felt by the Akademi. Within hours of the murder of Prof. M.M. Kalburgi, the Vice-President, the Convener of Kannada Advisory Board and some eminent Kannada writers strongly condemned the dastardly murder at a public meeting. Within days, they accompanied the family members of Prof. Kalburgi to meet the Chief Minister of Karnataka to ask for immediate investigation into the crime and protection for the family. The Akademi held a special public condolence meeting on 30th September 2015 at Bangalore in honour of Prof. M.M. Kalburgi where a large number of eminent writers condemned the assassination and paid their tribute to him. The Executive Board reconfirms this condemnation of the assassination of Prof. Kalburgi and records its own sense of pain and outrage at the atrocities against and the murders of authors in the past. 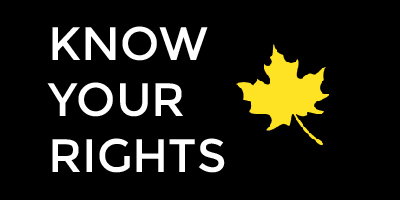 It also condemns the violence against fellow citizens from different walks of life. The Executive Board unanimously endorses the diligent and vigilant leadership provided by the President to keep the dignity of the Akademi intact and uphold the tradition and legacy of the Akademi.